The US$ per barrel (red line) and the rupee-dollar exchange rate (green line) are plotted to the left scale. The rupee per barrel (blue line) is plotted to the right scale. I have used data from the Petroleum Planning and Analysis Cell of the Ministry of Petroleum and Natural Gas – the global crude oil price of the ‘Indian Basket’ in US$ per barrel. 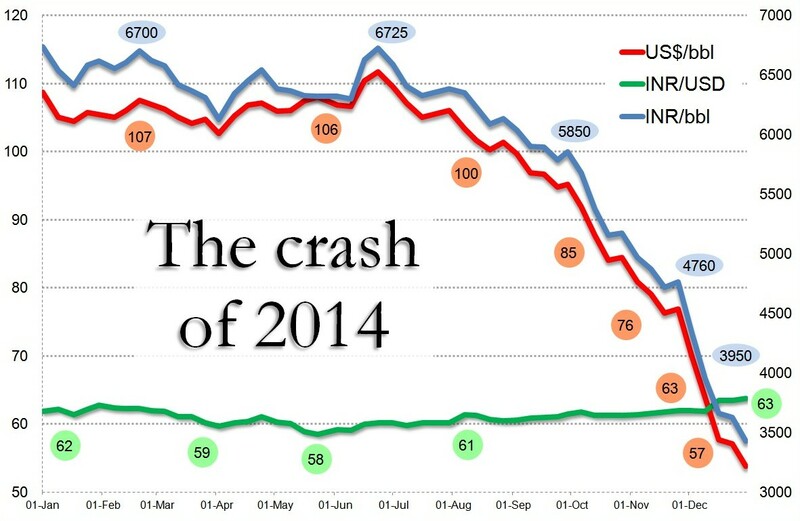 It started in early August, the extraordinary slide in petroleum prices. Until then, the international crude oil price of the ‘Indian Basket’ (of crude oils, as it is called) had swung between US$ 110 and US$ 105 per barrel. The rupee-dollar exchange rate, and the effective price of a barrel of crude oil in Indian rupees (both measures also appear on this chart), fluctuated but little for most of the first half of 2014. In early June 2014, the rupee-dollar rate turned around from 59 and has been rising since, while in early July the rupee price per barrel descended from its plateau of 6,300-6,600 and has been dropping since. The cost of oil-derived energy has had a number of effects upon our everyday lives in the second half of 2014. It has helped the new NDA-BJP government during its first year by dampening overall inflation (the consumer price index) and particularly food price inflation. This has been particularly fortunate for the NDA-BJP government as the deficient monsoon of 2014 has meant a drop in the production of food staples, and market forces being what they are, food price inflation especially would have been well into the 13%-14% range (last quarter 2014 compared with last quarter 2013). Galloping consumer price inflation has been forestalled by the plunging price of crude oil. 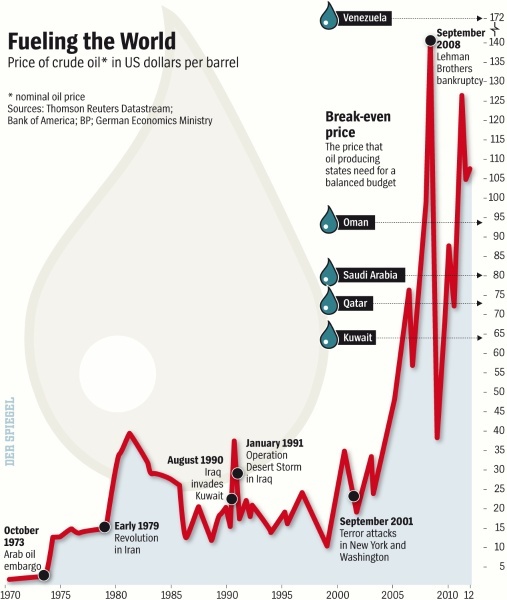 The data I have used for this startling chart is courtesy the Petroleum Planning and Analysis Cell (PPAC) of the Ministry of Petroleum and Natural Gas which computes several times a week the “global crude oil price of Indian Basket in US$ per bbl” – which means the average price we pay per barrel for the various kinds of crude oil we purchase. A barrel of crude oil is 42 gallons or around 159 litres. This crude, when refined, is turned into diesel, petrol, lighter fuels, feedstock for the manufacture of various plastics, and other products. Typically, up to 70% of the oil we buy is converted into diesel and petrol (and carbon from all those exhaust pipes). Also typically, a barrel of crude oil (which is an extremely dense form of packaged energy) contains around 5.8 million BTUs (British thermal units). More familiar to us is the kilowatt hour (or kWh) and these 5.8 million BTUs are about 1,700 kWh – at current national average rates of per head electricity consumption this is worth about 26 months of electricity! From early August till the end of December the price we paid for a barrel of crude has dropped from around US$ 103 to US$ 54 and correspondingly (factoring in the rupee-dollar exchange rate) the rupee price of a barrel of crude has dropped from 6,300 to around 3,500. Put another way, the INR 6,300 we paid in early August for 5.8 million BTU could buy, in mid-October 7.1 million BTU and by end-December, 10.4 million BTU. Most of us tend not to be profligate with energy (our electricity comes mainly from the burning of coal, but the sale of automobiles has continued at a steady pace, or so the industry tells us). The question is whether this windfall energy saving (in terms of petroleum energy units per rupee) has been well used by the sector that can spread the benefit the most – agriculture and food. It will take another three months to judge, and we will keep a wary eye for the next quarter on the Indian crude oil Basket. The revealing relationship between the FAO cereals price sub-index, the OPEC Reference Basket price of a barrel of crude oil, and the Baltic Dry Index (right scale). The Food and Agriculture Organisation (FAO) of the UN has released its food price index data and commentary for 2014 October. This would be of considerable interest if only the index described the tendencies of food prices as experienced by consumers. Alas FAO’s food price index, as we have remarked upon several times in the past, pays no attention to the true cost of food staples. Of what use is the FAO index, which is used as a reference by any government (and UN member state) to judge the value of its food exports (or to judge whether when importing grain it is paying what seems to be a fair price)? In the first place, the index (which itself is composed of separately calculated cereal, vegetable oil, dairy, meat and sugar indices) is not a consumer food price index. 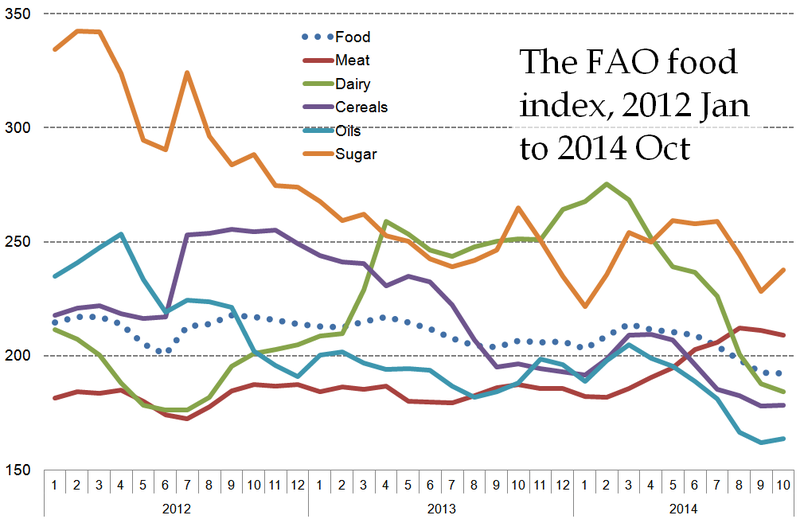 The FAO food price index and its component sub-indices for the period 2012 January to 2014 October. A general downward trend, says the FAO, but this is the picture for international food trade and not consumer food retail price. The FAO has not claimed it is, but neither has the agency clearly and plainly said it is not. It should, because financial and general interest media all over the world report the ups and downs of this index as if it portrays how local food prices move, and of course it does not. The FAO index is used by international traders whose business it is to buy and sell food staples (including cereal, vegetable oil, pulses, dairy, meat and sugar). Perhaps some of them use it as a benchmark while others forecast trends from its sub-indices. It may be used to validate the accuracy of a particular kind of agricultural commodity futures index, and help judge whether an investment in the production of food, its movement, its stocking or its trade is going to be a good investment or not. As you can gather, it is not an index that consumers can use, because consumers are local and this is assuredly not. What pulls the FAO food price index up, down or sideways? There are two important factors at work on the main index. One is the price of petroleum products, the other is the cost of moving grain (or any other food staple). You may assess the short or long-term trend of the food index against the current or projected price of Brent crude (preferred in Europe), West Texas Intermediate (preferred in the USA) or the OPEC reference price (preferred almost everywhere else). 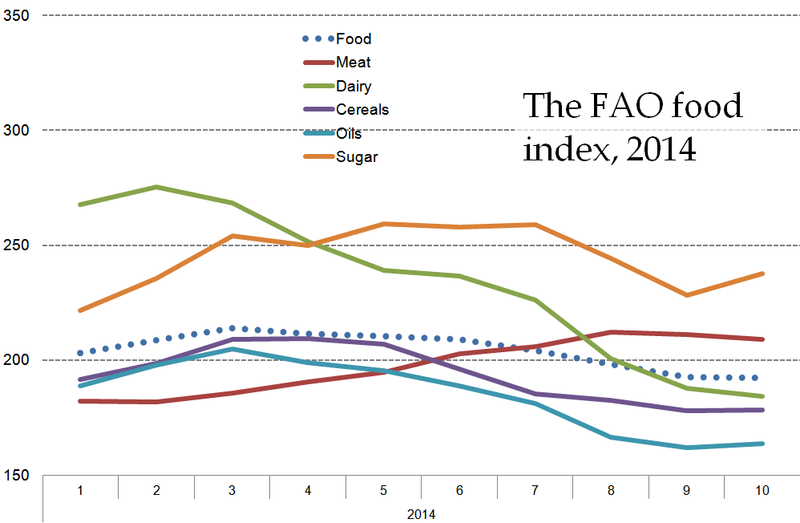 The FAO food price index and its component sub-indices for 2014 till October. The downward trend of the last six months, which the FAO commentary is faintly praising, mirrors the trend of crude oil prices over the same period. And then you will assess what the food price index describes against the cost of moving a large quantity of the agricultural commodity to be traded across an ocean, for which the Baltic Dry Index will be consulted. To help determine what the FAO food price index is depicting, I have made charts for the index (and sub-indices) for the period 2012 January to 2014 October; for the index (and sub-indices) for 2014 till October; a chart that shows the FAO cereals sub-index together with the OPEC Reference Basket Price for a barrel of crude oil and the Baltic Dry Index (this is the shipping index most commonly referred to for the movement of dry goods by sea) for the period 2012 January to 2014 October; and a chart that plots the changes (from month to month) in the three indexes taken together (FAO Cereals, OPEC Reference and Baltic Dry). The FAO food price index and the OPEC Reference Basket price of oil have much more in common than the Baltic Dry Index, which has swung with volatility since 2012 January. 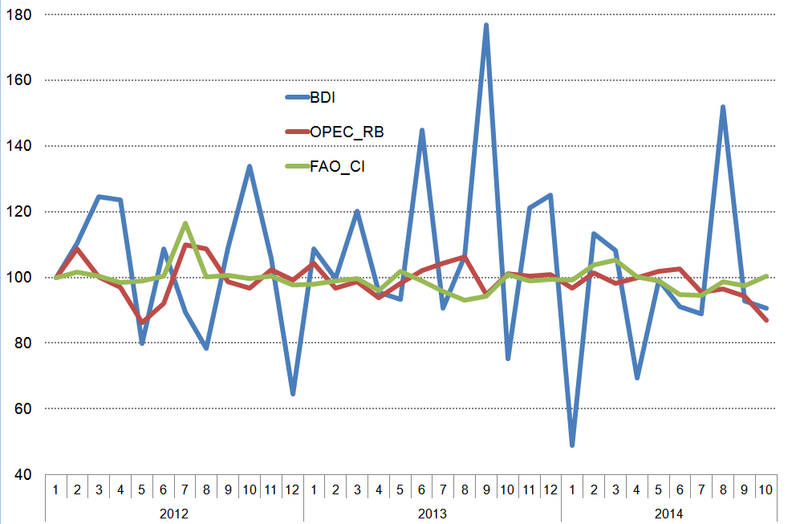 What they describe can be found in the captions, but it becomes clear from a glance at the FAO-OPEC-Baltic charts that the food price as calculated by FAO has very much more to do with how energy is used to produce food staples (that is, the use of petroleum products directly, and the use of fossil fuels-derived energy) and how energy is used to transport, store, process, transport it again and retail it. I see it as an index that describes the energy quotient of industrially produced food staples, and so it has little if anything to do with any other form of agriculture, in particular the smallholder, family-oriented and organic agriculture that the FAO advertises its concern about. More than ever, these charts by Nature, the science magazine, show, countries are providing themselves with energy from (what they continue to believe are abundant supplies of) fossil fuels. 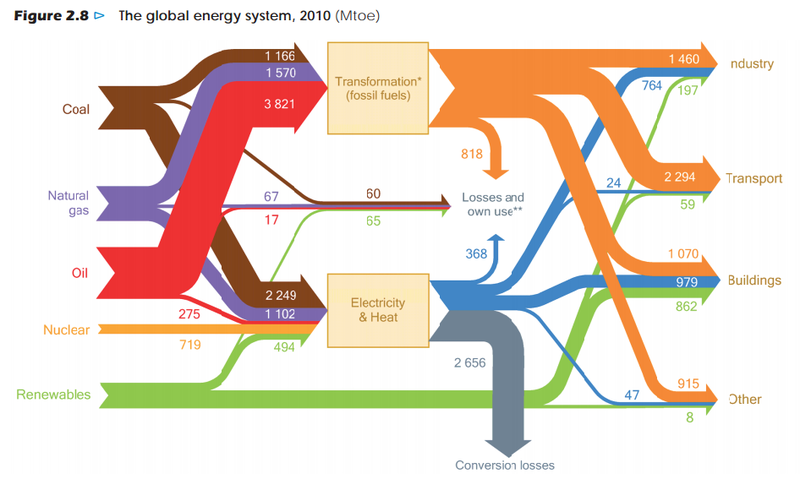 Nature also has a clickable guide to the world’s energy use which you can use to find out which countries were using up Earth’s resources fastest in 2011 (they’ve charted the numbers from the BP Statistical Review of World Energy 2012) and which ones were taking a lead on renewable energy. In four parts, 18 chapters, four annexes, illustrated by around 300 figures, the chapters supported by about 100 tables, a separate set of data upon which scenarios rest, the World Energy Outlook 2012 of the International Energy Agency (IEA) is a 690-page behemoth. I can only sketch its merest outline here, and in a fleeting way touch upon the knowledge and information it contains. 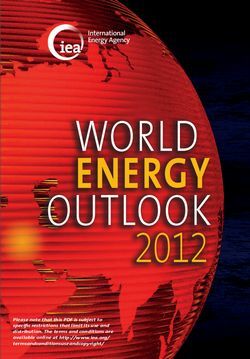 Drawing on the latest data and policy developments, the World Energy Outlook 2012 presents projections of energy trends through to 2035 and insights into what they mean for energy security, the environment and economic development. “Over the Outlook period, the interaction of many different factors will drive the evolution of energy markets,” said the WEO-2012. “As outcomes are hard to predict with accuracy, the report presents several different scenarios, which are differentiated primarily by their underlying assumptions about government policies.” We are told that the starting year of the scenarios is 2010, the latest year for which comprehensive historical energy data for all countries were available. What are these four scenarios? 1. The New Policies Scenario – the report’s central scenario – takes into account broad policy commitments and plans that have already been implemented to address energy-related challenges as well as those that have been announced, even where the specific measures to implement these commitments have yet to be introduced. 2. To illustrate the outcome of our current course, if unchanged, the Current Policies Scenario embodies the effects of only those government policies and measures that had been enacted or adopted by mid-2012. 3. The basis of the 450 Scenario is different. Rather than being a projection based on past trends, modified by known policy actions, it deliberately selects a plausible energy pathway. The pathway chosen is consistent with actions having around a 50% chance of meeting the goal of limiting the global increase in average temperature to two degrees Celsius (2°C) in the long term, compared with pre-industrial levels. 4. 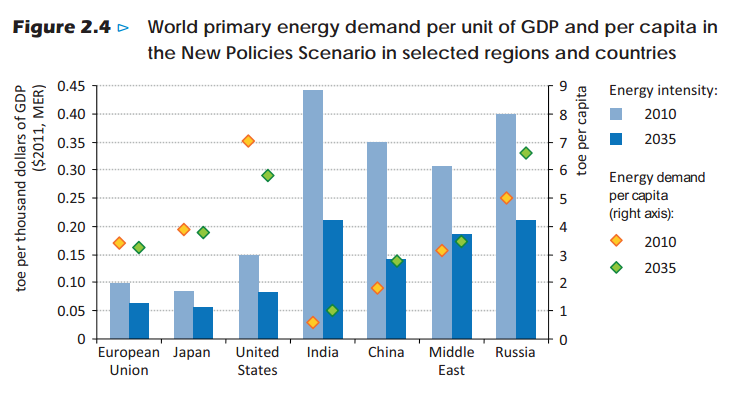 The Efficient World Scenario has been developed especially for the World Energy Outlook 2012 (WEO-2012). It enables us to quantify the implications for the economy, the environment and energy security of a major step change in energy efficiency. I have extracted five important messages from the summary which are connected to the subjects you find in this blog – food and agriculture, consumer behaviour and its impacts on our lives, the uses that scarce energy is put to, the uses that scarce water is put to, the ways in which governments and societies (very different, these two) view food, energy and water. “Energy efficiency can keep the door to 2°C open for just a bit longer.” Successive editions of the World Energy Outlook have shown that the climate goal of limiting warming to 2°C is becoming more difficult and more costly with each year that passes. 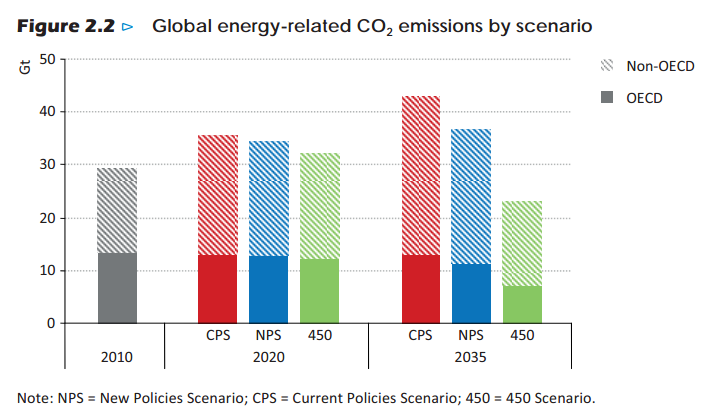 The 450 Scenario examines the actions necessary to achieve this goal and finds that almost four-fifths of the CO2 emissions allowable by 2035 are already locked-in by existing power plants, factories, buildings, etc. No more than one-third of proven reserves of fossil fuels can be consumed prior to 2050 if the world is to achieve the 2°C goal. “Will coal remain a fuel of choice?” Coal has met nearly half of the rise in global energy demand over the last decade, growing faster even than total renewables. Whether coal demand carries on rising strongly or changes course will depend on the strength of policy measures that favour lower-emissions energy sources, the deployment of more efficient coal-burning technologies and, especially important in the longer term, CCS. 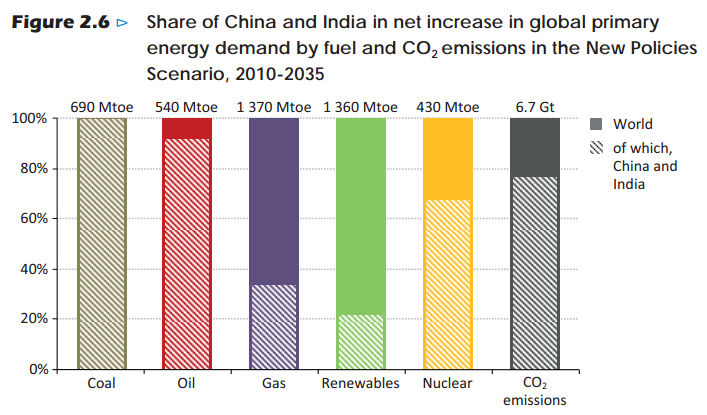 The policy decisions carrying the most weight for the global coal balance will be taken in Beijing and New Delhi – China and India account for almost three-quarters of projected non-OECD coal demand growth (OECD coal use declines). “If nuclear falls back, what takes its place?” The anticipated role of nuclear power has been scaled back as countries have reviewed policies in the wake of the 2011 accident at the Fukushima Daiichi nuclear power station. Japan and France have recently joined the countries with intentions to reduce their use of nuclear power, while its competitiveness in the United States and Canada is being challenged by relatively cheap natural gas. The report’s projections for growth in installed nuclear capacity are lower than in last year’s Outlook and, while nuclear output still grows in absolute terms (driven by expanded generation in China, Korea, India and Russia), its share in the global electricity mix falls slightly over time. “A continuing focus on the goal of universal energy access.” Despite progress in the past year, nearly 1.3 billion people remain without access to electricity and 2.6 billion do not have access to clean cooking facilities. Ten countries – four in developing Asia and six in sub-Saharan Africa – account for two-thirds of those people without electricity and just three countries – India, China and Bangladesh – account for more than half of those without clean cooking facilities. The report presents an Energy Development Index (EDI) for 80 countries, to aid policy makers in tracking progress towards providing modern energy access. The EDI is a composite index that measures a country’s energy development at the household and community level. “Energy is becoming a thirstier resource.” Water needs for energy production are set to grow at twice the rate of energy demand. The report estimates that water withdrawals for energy production in 2010 were 583 billion cubic metres (bcm). Of that, water consumption – the volume withdrawn but not returned to its source – was 66 bcm. The projected rise in water consumption of 85% over the period to 2035 reflects a move towards more water-intensive power generation and expanding output of biofuels. Such is the barest glimpse of the WEO-2012. There are a number of aspects of the Outlook which deserve more scrutiny with a view to learning energy use and misuse, and this will be expanded upon in the weeks ahead. The real nature of the US-NATO invasion of Libya has become even clearer in the last week. The orchestrated media coverage, similar to the trigger-happy reportage that marked the Gulf Wars and the USA’s Iraq and Afghanaistan wars, has focused on demonising Muammar Gaddafi and on the ‘rebels’ who are now in Tripoli. Absent from the popular coverage, especially on television, is the ordinary Libyan. Not absent any longer are the commercial roots of this invasion, for the German media are now openly talking about the business opportunities or Libyan “reconstruction”. 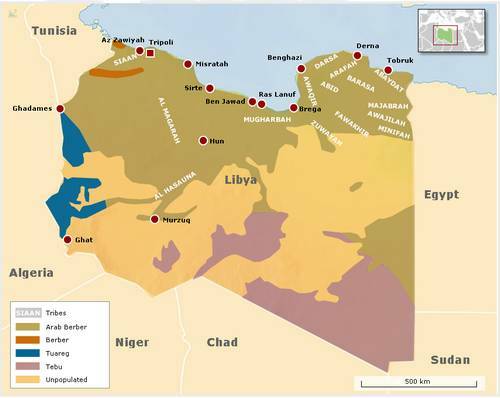 The Security Council’s stipulations that ground troops not be introduced into the country, that an arms embargo be kept in place and that mercenaries be prevented from entering Libya have all been flouted in this criminal operation to seize control of an oil-rich former colony and loot its resources, observed the World Socialist Website. There is barely any attempt to hide the fact that special forces, intelligence agents and mercenary military contractors have organized, armed and led the “rebels”, who have not made a single advance without the prior annihilation of government security forces by NATO warplanes. After being terrorized for five months by NATO bombs and missiles, the people of Tripoli are now facing sudden death and a looming humanitarian catastrophe as a result of the NATO campaign to “protect civilians”. 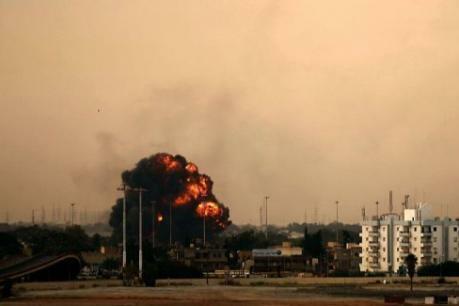 Kim Sengupta of the Independent reported Thursday from the Tripoli neighborhood of Abu Salim, which the “rebels” stormed under the cover of NATO air strikes. Known as a pro-Gaddafi area, its residents have been subjected to a reign of terror. Asked why local residents were resisting the NATO-led force’s takeover of the city, Mohammed Selim Mohammed, a 38-year-old engineer, told the Independent, “Maybe they just do not like the rebels. Why are people from outside Tripoli coming and arresting our men?” Meanwhile, other reports laid bare war crimes carried out by NATO and its local agents on the ground in Tripoli. Both the Associated Press and Reuters news agencies documented a massacre perpetrated against Gaddafi supporters in a square adjacent to the presidential compound that was stormed and looted on Tuesday. The pretence that the US and its European NATO allies were intervening in Libya to “protect civilians and civilian populated areas from threat of attack,” as stated in the United Nations Security Council resolution, has effectively been abandoned. Behind the fig leaf of this resolution the naked imperialist and colonial character of the war has emerged. Der Spiegel has reported that three weeks ago, Hans Meier-Ewert, head of the German-African Business Association, travelled to Libya together with representatives from 20 German companies. Since all regularly scheduled flights to Tripoli have long ago been cancelled, the German government made a Transall military transport plane available for the journey, and the mission was headed up by Hans-Joachim Otto, a state secretary in the German Economics Ministry. In Benghazi, where the rebel movement is headquartered, the group handed over aid goods and medical supplies to the city’s hospitals – public relations and photo ops. There, the Germans also met with representatives of the Libyan transitional council and of the country’s central bank in an effort to pursue economic interests in the country. Libya is rich relative to its African neighbors, but the Europeans consider its infrastructure woefully inadequate. Felix Neugar, an ‘expert’ on Africa with the German Chamber of Industry and Commerce (DIHK), has complained that Libya lags far behind the high standard of the large Gulf oil producers. The Germans aren’t the only ones who have begun exploring opportunities in post-Gadhafi Libya. The Italian oil concern Eni is doing all it can to defend its status as the largest foreign oil producer in the country. Even before the rebels stormed the Gadhafi residence in Tripoli this week, Eni technicians had begun preparing to restart the flow of oil. And Eni has the full support of the government in Rome. Prime Minister Silvio Berlusconi is meeting with rebel leader Mahmoud Jibril in a few days. “Right now it is still too early to say when, how and under what conditions production can begin again in Libya,” said BASF subsidiary Wintershall, an oil producer active in the country since 1958, told Der Spiegel. The war also interrupted the construction of a highway that the German firm STRABAG had been working on. 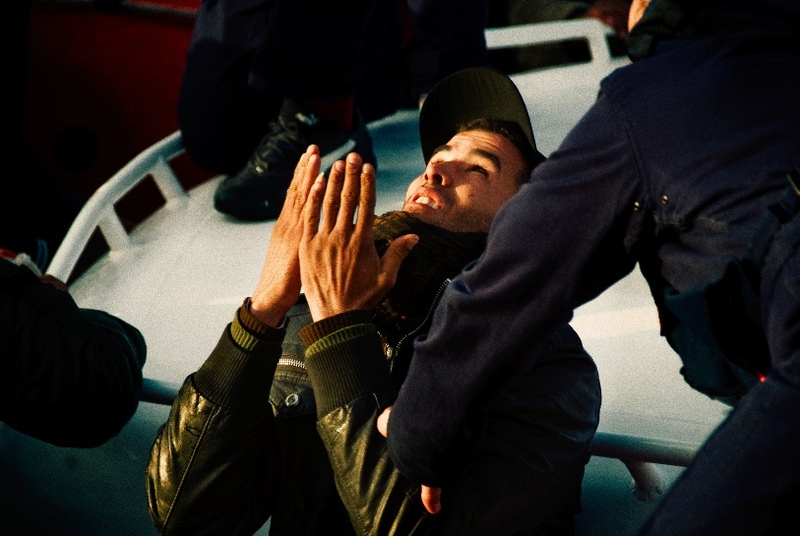 This autumn, the company plans to send a team to Libya to assess the situation. RWE Dea, another German firm that drills for oil in Libya, hopes the new government will uphold existing contracts. In the end, raw material exploitation contributes to reconstruction, the company says. A lucrative reconstruction however requires destruction to be visited on Libya and its populace. This is taking place in appalling measure. Reporting from a local hospital, the Telegraph said: “As battle raged in the Tripoli streets hundreds of casualties were brought in, rebel fighters, Gaddafi’s soldiers, and unlucky civilians, laying next to each other in bed and even on a floor awash with blood, screaming or moaning in agony. Many died before they could be treated.” The paper interviewed Dr Mahjoub Rishi, the hospital’s Professor of Surgery: “There were hundreds coming in within the first few hours. It was like a vision from hell. Missile injuries were the worst. The damage they do to the human body is shocking to see, even for someone like me who is used to dealing with injuries.” Most of the casualties, he said, were civilians caught in the crossfire. The Telegraph reported that Tripoli’s two other major hospitals were similarly overflowing with casualties and desperately understaffed, as were all of the city’s private hospitals. The aid group Medecins Sans Frontieres (MSF) warned that the city is facing a medical “catastrophe”. The group told Reuters that “Medical supplies ran low during six months of civil war [i.e., NATO bombardment] but have almost completely dried up in the siege and battle of the past week. Fuel supplies have run out and the few remaining medical workers are struggling to get to work.” The lack of fuel means that hospitals that have kept their power by running generators can now no longer do so. Health officials in Tripoli report that blood supplies have run out at the hospitals and that food and drinking water is unavailable over whole areas of Tripoli. Distant from the battle, the hapless civilian victims and the constant terror of US-NATO airborne drones, fighter jets, bombers and surveillance aircraft, Western leaders have been parcelling out Libya’s future – this is mostly taking place in Paris, as the French government has played a leading role in the so-called “international deployment” against Gadhafi. The French government has proposed a quick meeting of the so-called Libya Contact Group, which is comprised of the countries that participated in the military operation. Germany, given its abstention in the United Nations vote to endorse a no-fly zone, is not a member of the group. The meeting could happen as soon as next week, and high on the agenda will be drafting a plan together with the National Transition Council for the “international community’s” future role in Libya. The European Union’s deadly doublespeak is being broadcast regularly: “The way is now open for Libya for freedom and self-determination,” European Commission President Jose Manuel Barroso and European Council President Herman Van Rompuy said in a joint statement. They added that Europe would make “every endeavour” it could to help, providing “support for its democratic transition and economic reconstruction”. Of course it will, at a cost in North African lives and for a profit to be reckoned in many billions of euros. Since 2011 January, the FAO food price index components have recorded some of their highest monthly readings. Sugar touched a peak in January (420.2) and February (418.2), oils reached highs in February (279.3) and January (277.7), cereals reached highs in April (265.4) and May (261.3), meat touched a peak in June (180.4) and in April (180.4). The consolidated food price index has been within 6 points (2.5%) of the February peak (237.7) for all the months of 2011. In June 2011 the index is less than 4 points off the February peak. 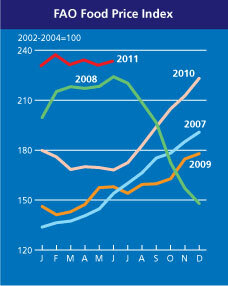 FAO’s Food Price Index rose one percent to 234 points in June 2011 – 39 percent higher than in June 2010 and four percent below its all-time high of 238 points in February of this year. The FAO Cereal Price index averaged 259 points in June, down one percent from May but 71 percent higher than in June 2010. Improved weather conditions in Europe and the announced lifting of the Russian Federation’s export ban contributed to the price drop. However the maize market remained tight because of low 2010 supplies and continued wet conditions in the United States. Prices of rice were mostly up in June, reflecting strong import demand and uncertainty over export prices in Thailand, the world’s largest rice exporter. The FAO Sugar Price Index rose 14 percent from May to June, reaching 359 points, 15 percent below its January record. Production in Brazil, the world’s biggest sugar producer, is forecast to fall below last year’s level. The FAO Dairy price Index averaged 232 points in June, virtually unchanged from 231 points in May. The FAO Meat Price Index averaged 180, marginally up from May with poultry meat rising three percent and climbing to a new record, while pig meat prices declined somewhat. Following two consecutive revisions to the US crops and planting prospects for 2011, FAO’s latest forecast for world cereal production in 2011/2012 stands at nearly 2 313 million tonnes, 3.3 percent higher than last year and 11 million tonnes above FAO’s last forecast on 22 June. World cereal utilization in 2011/2012 is forecast to grow 1.4 percent from 2010/2011, reaching 2 307 million tonnes, just five million tonnes under forecast production. World cereal stocks at the close of the crop season in 2012 are now expected to stand six million tonnes above their opening levels. While wheat and rice inventories are expected to become more comfortable, coarse grains stocks, especially maize, would remain tight. The FAO Food Price Index (FFPI) averaged 234 points in June 2011, 1 percent higher than in May and 39 percent higher than in June 2010. The FFPI hit its all time high of 238 points in February. A strong rise in international sugar prices was behind much of the increase in the June value of the index. International dairy prices rose slightly in June, while meat prices were stable. Of all the major cereals, prices of wheat fell most and rice increased. Among the oils and fats, prices of soybean oil were steady but palm oil weakened. 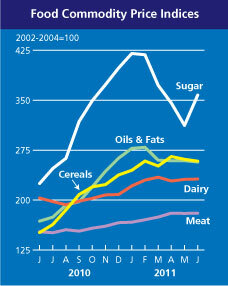 The FAO Cereal Price Index averaged 259 points in June, down 1 percent from May but 71 percent higher than in June 2010. Improved weather conditions in Europe and the announced lifting of the export ban by the Russian Federation (from July) depressed wheat prices. However, maize markets were supported by tight old crop (2010) supplies and continued wet conditions in the United States. Prices of rice were mostly up in June, reflecting strong import demand and uncertainty over export prices in Thailand, the world largest rice exporter. 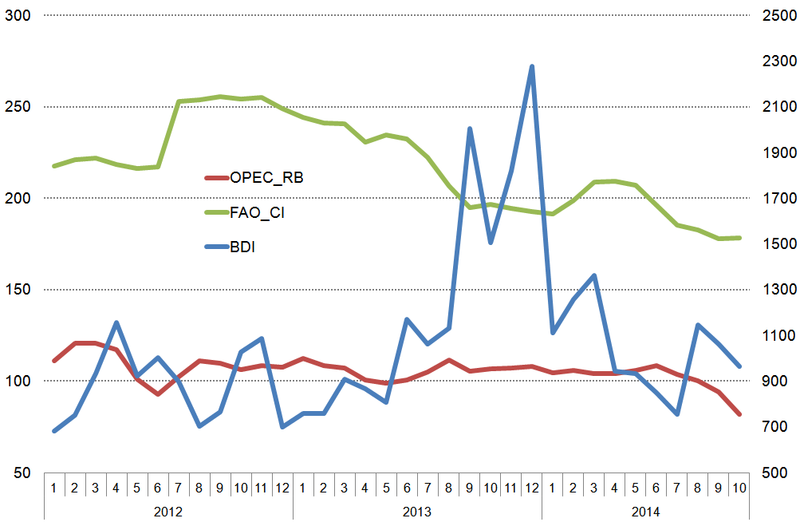 The FAO Oils/Fats Price Index averaged 257 points in June, down marginally from May. Continued production uncertainties and expectation of stronger world import demand sustained soybean oil prices. By contrast, palm oil prices eased further, reflecting improved supply prospects and ample export availabilities in Southeast Asia. The FAO Dairy Price Index averaged 232 points in June, virtually unchanged from 231 points in May. This was the result of diverging price movements, with prices of skim milk powder and casein up by 5 percent, whole milk powder down by 3 percent, while prices of butter and cheese remained stable. The FAO Meat Price Index averaged 180 points, marginally up from May. Poultry meat prices experienced a 3 percent rise, breaking a new record, while pig meat prices declined somewhat. Prices of bovine and ovine meat were subject to modest increases, from already high levels. The FAO Sugar Price Index averaged 359 points in June, up 14 percent from May and only 15 percent below its January record. The price strength reflects dynamic short-term demand against tight exportable availabilities, notably in Brazil, the world’s largest sugar producer where production is forecast to fall below last year’s level. This week in 1936 the Mussolini regime’s declaration of an Italian empire in East Africa, upon its formal annexation of Ethiopia, increased tensions among the Great Powers, pushing the world closer toward a global conflagration. 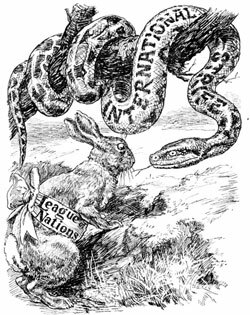 The annexation was an open repudiation, said the World Socialist Web Site, of the norms of international law and the most devastating rebuke yet suffered by the League of Nations, forerunner of the United Nations, which had failed miserably to check Rome’s aggression. Likewise implicated were Britain, which had allowed the Italian war machine to pass through the Suez canal, and France, which was seeking to maintain Italian support for the Locarno Pact against Germany aggression. In response, Britain sent a diplomatic mission to Hitler seeking Germany’s non-recognition of Mussolini’s conquest, while France remained oriented toward maintaining Italy’s support against Germany. With all of Africa now divided by the Europeans—the exception being small Liberia in the west—no further gains could be made on the continent without war among the European powers. Today, Italy’s participation in the war stems from the fear that it could lose its influence in Libya to France, Britain and the United States. The Financial Times noted: “The Franco-Italian spat over immigration follows sharp differences over Libya, where Rome has been dragged into a war it would rather avoid, fearing a Paris-Benghazi nexus will freeze out its substantial interests in Libyan oil and gas”. 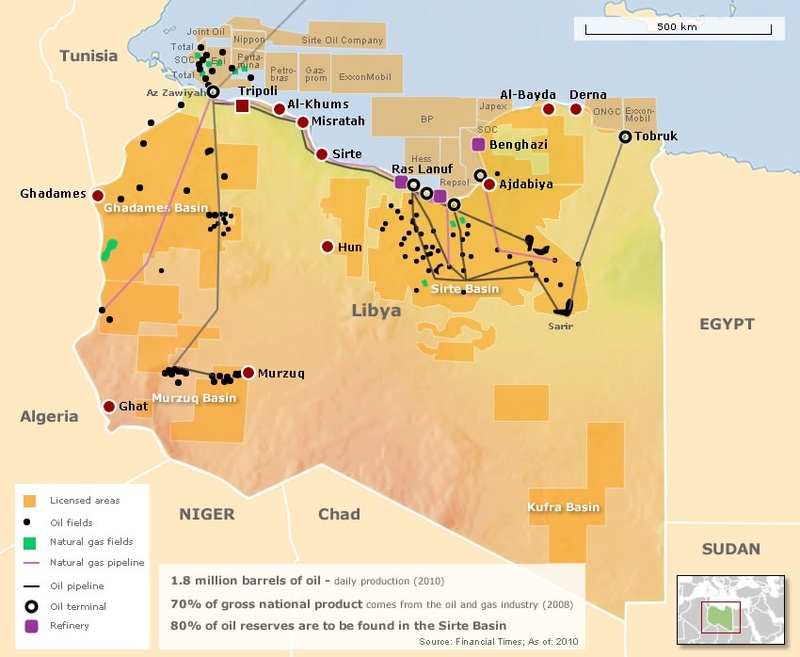 The Libyan oil and gas reserves are a powerful motive for the Italian bourgeoisie to participate actively in the inter-imperialist struggle over their North African neighbour. 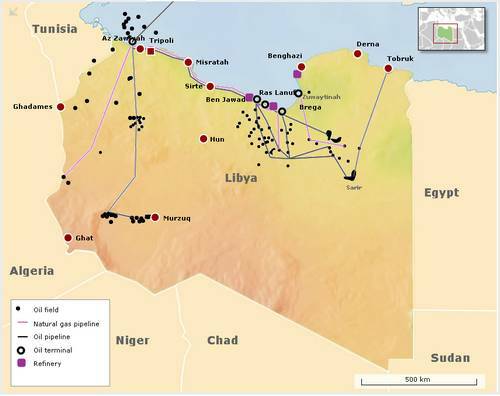 Italy draws a quarter of its oil imports and ten percent of its natural gas from Libya. 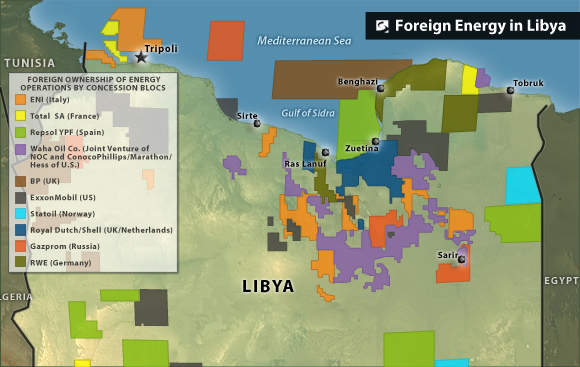 The energy group ENI has invested billions of euros in assets in Libya. Until the outbreak of open hostilities, Italy was the largest foreign trade partner of Libya, the largest buyer of its crude oil, and one of Gaddafi’s largest arms suppliers. The German government has stopped the government from India from paying for oil, bought from Iran, through a German bank. This action has been explained by the German government as halting its dealings with Iran, which America, Germany’s Nato ally, has placed under an economic blockade for allegedly pursuing a nuclear weapons programme. The extreme but characteristic hypocrisy of Germany with regard to countries of the Middle East has once again come to the fore with this action. Ever since the outbreak, in 1991, of the American invasion of Iraq, Germany’s private sector role in providing engineering and technical know-how to countries of the Middle East – specifically Iran, Iraq (under Saddam Hussein) and Libya – has been exposed. (America’s own complicity in arming, supporting and dealing with all manner of governments is too well-known.) More on the German hypocrisy follows after a brief description of the immediate action. 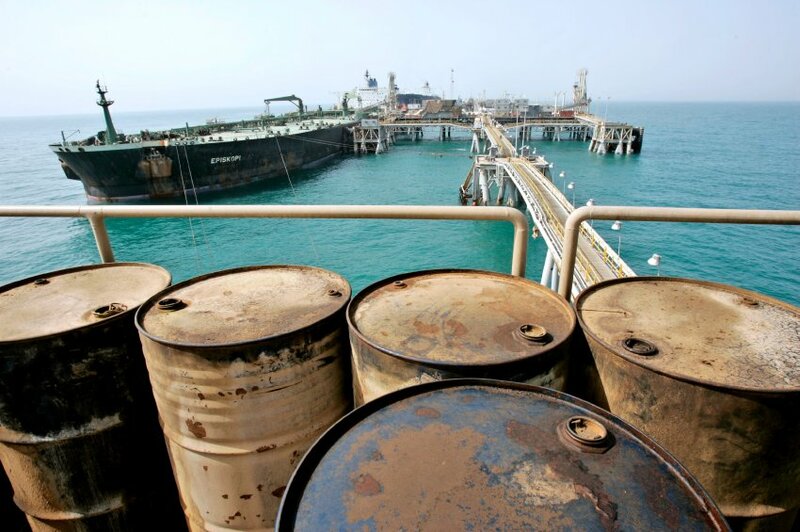 New media have today reported that India has agreed to stop paying for its Iranian oil imports via Germany. Payments to a Hamburg-based bank handling international trade with Iran had been halted. The Handelsblatt business daily has reported that German chancellor Angela Merkel had intervened by instructing Germany’s central bank, the Bundesbank, to stop clearing payments from India headed to the bank, known as EIH, which is under USA but not EU sanctions. Reuters has reported that this action will end “a trade conduit that had drawn strong disapproval from the United States and Israel” and that “the decision was a result of consultations between Berlin and New Delhi, and not pressure from Chancellor Angela Merkel at home or abroad to disrupt the payment scheme”. The news bulletin has been picked up by a number of small and regional newspapers in the USA, going under the headline ‘Germany won’t funnel oil money from India to Iran’. 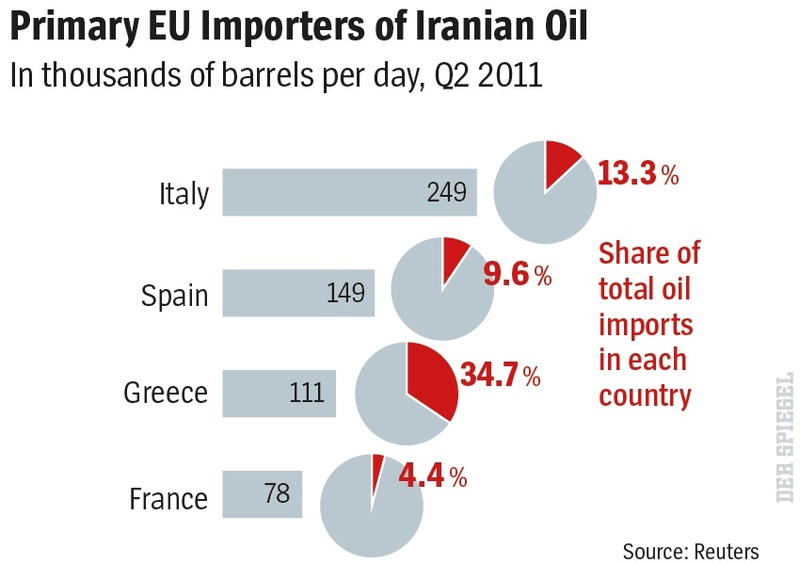 India depends on Iran for about 15% of its crude oil imports. 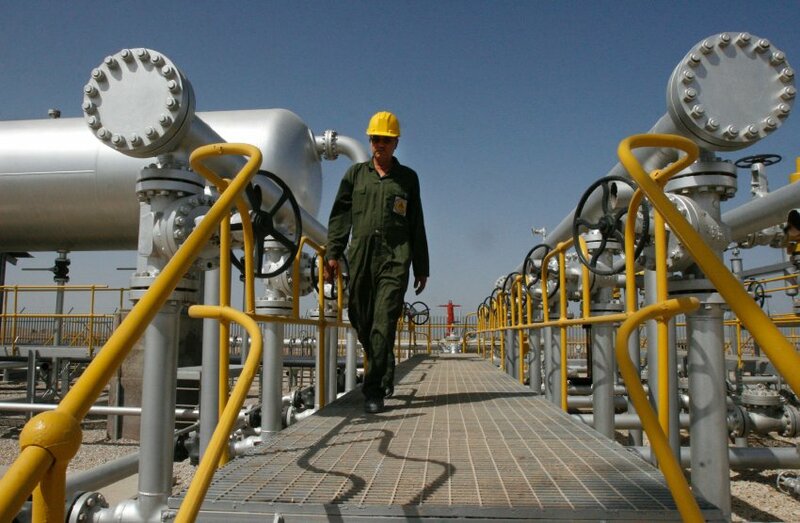 Iran is India’s second-biggest oil supplier after Saudi Arabia. India had imported 400,000 barrels per day (bpd) of oil from Iran in 2009-10 and about 178,000 bpd during April-September. India, Asia’s third-largest oil consumer, imports over two-thirds of its oil needs and depends heavily on volumes from the West Asia to power its economy. India and Iran have been negotiating for months on ways to resolve the payment deadlock on a long-term basis and salvage the trade, which is worth around US$12 billion annually. 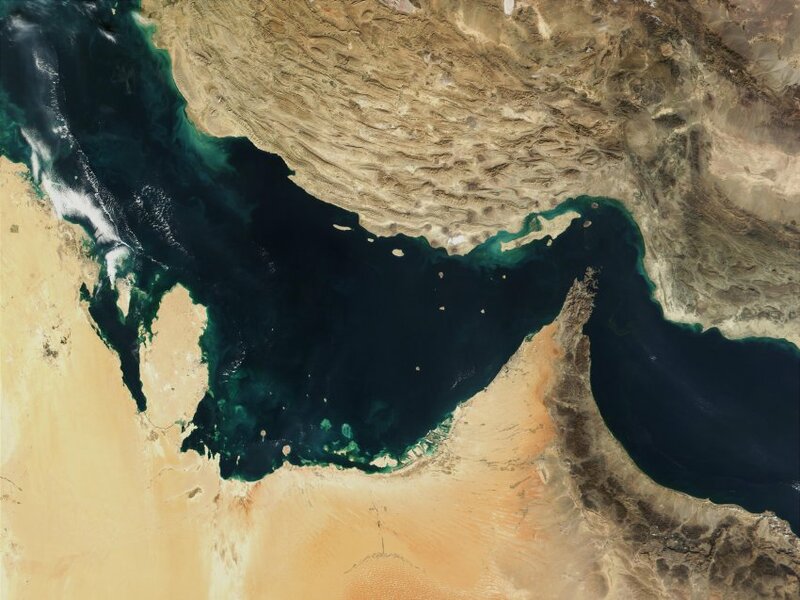 So much for India’s oil dealings with Iran. What moral standing has Germany in such a matter? Let’s revisit the recent past to see what Germany’s current imperialist ally in Libya – the USA – has itself had to say on German interest in Middle Eastern and North African business opportunities. Remember Rabta? This was reported to be the largest chemical weapons factory in the developing world, and in the 1990s it was estimated that the Rabta factory’s potential output was between 8.5 and 33 tons of mustard gas and nerve agent daily. The Rabta plant, about 65 km south of Tripoli, was seen as having been buit and operated with the assistance of western (i.e. from western Europe) companies. At the time, it was the USA which concluded that a West German company played a central role in the design and construction of the rabta plant. Ronald Reagan was US president then and Helmut Kohl the German chancellor. The company was Imhausen-Chemie, and both the company and the feckless German government of the day claimed that all it was doing at Rabta was making plastic bags. Let’s turn to Germany and Iran. Germany has been intensely involved in the international effort to thwart Iran’s nuclear weapons development program. Yet, while Chancellor Merkel has vocally stated her opposition to Iran’s acquisition of a nuclear weapon, Germany has continued to be Iran’s largest trading partner in the EU and – whatever shape the coalition government in Berlin has taken – it has been pro-business, favouring commercial ties over the West’s security interests – this is typical, after all, for the country that until last year was the world’s biggest expoert economy, business comes first, never mind who it’s done with and what it’s used for. Germany’s exports to Iran reached about US$426 million in September 2009, while its imports were about US$140 million. 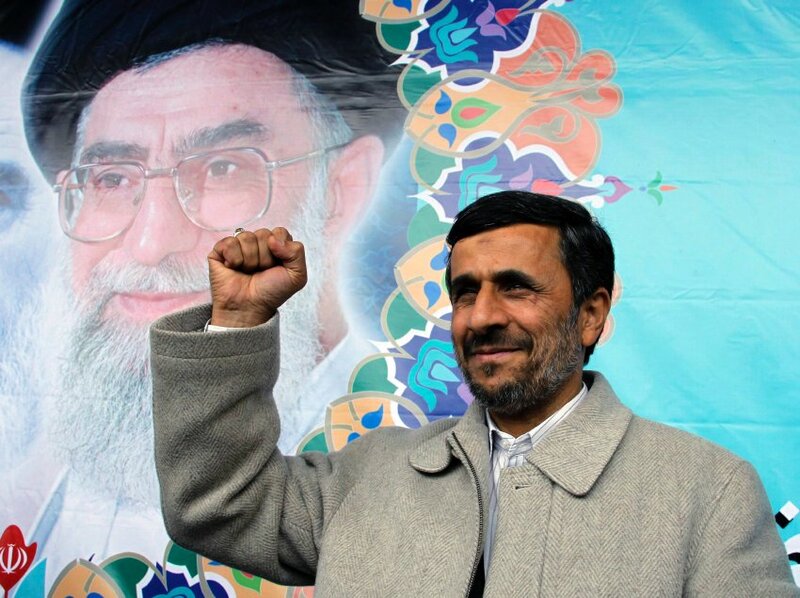 This has been reported by The Jerusalem Post (September 29, 2009) and by Tehran Times (December 17, 2009). Which are the major companies that have, with the full knowledge and encouragement of the German government, done business in and with Iran? Some of the best-known are Siemens, ThyssenKrupp, BASF, Bayer, Herrenknecht and MAN Ferrostahl. It is tiresome to hear sanctimonoius claptrap about Germany’s replacement of the primitive nationalisms of the past with multilateral principles of an integrated Europe, as its lying and double-dealing officials assure the European Parliament and international fora every so often. The “forgetting of power” in the West German peace movements and in the political language of détente used by its over-intellectualised political commentators is plain rubbish, for what Germany does abroad is quite different from what it says at home in Europa. French military jets have begun enforcing the UN backed no-fly zone over Libya, Russia Today has reported, as international forces prepare to carry out possible air strikes. At an emergency meeting in Paris, attended by French President Nicolas Sarkozy, British Prime Minister David Cameron, US Secretary of State Hillary Clinton, UN chief Ban Ki-moon and representatives of the Arab League, it was decided to resort to military action to enforce the no-fly zone. RT quoted news reports as having said that the operation is expected to involve British, Arab, Canadian and Danish jets, as well as French. ­Italy, France and Spain will provide airbases for support in the region. 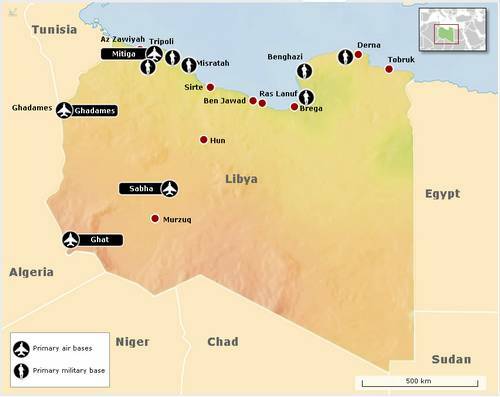 Arab states – Saudi Arabia, Qatar and United Arab Emirates – said they do back the no-fly zone over Libyan airspace. There is a report in the French news site Libération titled ‘Sarkozy annonce le début d’une action militaire en Libye’. The UN news service has said that the UN Security Council “today effectively authorised the use of force in Libya to protect civilians from attack”, specifically in the eastern city of Benghazi, which Colonel Muammar Al-Qadhafi has reportedly said he will storm tonight to end a revolt against his regime. Acting under Chapter VII of the UN Charter, which provides for the use of force if needed, the Council adopted a resolution by 10 votes to zero, with five abstentions, authorizing Member States “to take all necessary measures… to protect civilians and civilian populated areas under threat of attack in the Libyan Arab Jamhariya, including Benghazi, while excluding an occupation force.” The abstentions included China and Russia, which have the power of veto, as well as Brazil, Germany and India. The full text of the UN Security Council resolution is here. What is the ‘no fly’ zone about, and why are the Western powers committing fighter jets to maintaining it? Aijaz Ahmad has been interviewed on MR Zine. He said: “A no-fly zone is not about flying aircrafts. It’s about laying the groundwork for occupying at least certain parts of the country and for destroying the garrisons and fighting capacity on the ground. Robert Gates and others in charge of the American defense establishment have said that a no-fly zone really means a ground attack on the country. So that’s what a no-fly zone really is about. It’s not about some great air force that Gaddafi has because he doesn’t. Part of this council that has been set up in Benghazi has called for a no-fly zone.” It is about Libyan oil and gas, after all.